Imagine an adult thug who comes upon a group of warring 12-year-olds who are split up into two rival gangs. The thug can beat up anyone he chooses, so he decides to toy with the young upstarts by sadistically siding with one side and then the other in order to cause the most physical damage. You wouldn’t think that such a storyline would be material for a blockbuster film hit, but this is the underlying structure of Akira Kurosawa’s Yojimbo (1961). Of course the setting is different – here it is Japan in the socially turbulent 1860s, the thug is a wandering ronin (masterless samurai), and the two warring factions are two rival gangs in a small town seeking to control the burgeoning gambling business. The story was remade by Sergio Leone as A Fistful of Dollars (1964), and Kurosawa’s production company successfully sued the Italian producer and reaped 15% of the earnings of that film. But actually, I think the connection with Leone’s film probably caused many people to go back and discover Yojimbo, and it ultimately increased its revenues, too. Much of the commentary on Yojimbo has centered around the film genre influences on the work – the degree to which the film owes its origins to American westerns (cowboy films), gangster films, or indeed whether it should be considered ultimately to be a side-splitting comedy. The film does seem to have an eclectic set of historical influences on it, but I won’t enter into these issues. What is of interest is the story as presented and how the tale is told. The narrative of Yojimbo goes through five basic acts, and it has some interesting aspects to it. Seibei is one gang leader. He used to run the gambling racket, but when he tried to retire and pass on his realm to his son, Yoichiro, his right-hand man, Ushi-Tora, rebelled and formed the rival gang. Tazaemon is a wealthy but relatively impotent silk merchant who backs Seibei. The Seibei gang controls one end of the town, and the Ushi-Tora gang the other. So the main street in between is something of a no-man’s land separating the two factions, whose fighting forces are mainly hired thugs. After hearing this account, Sanjuro decides to stay and sell himself to the highest bidding gang. To demonstrate his prowess, he walks over to the Ushi-Tora side and picks a fight with a few of the Ushi-Tora gang members. 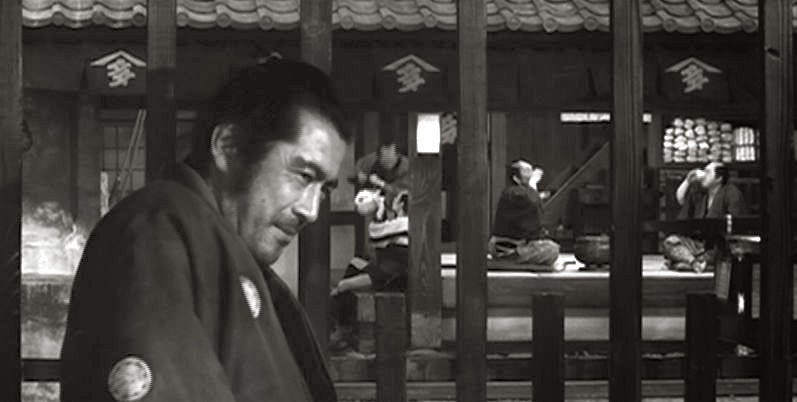 In about six seconds of screen time, Sanjuro uses his sword to slay two men and cut of the arm of a third thug. This will be a visual motif of the film – much of the screen time is spent slowly building up the suspense with planning and threats. When the real action takes place, it is explosive and so fast that you can hardly see what’s happening. Of course, this film was made before the advent of computer-assisted, wire-fu cinematics, but the overall effect on the viewer is no different. We are astonished by the almost magical powers of the ronin’s swordsmanship. Sanjuro negotiates with both sides in an attempt to get the best rate for his peerless services. He, himself, is totally cynical – his goal is to see to it that as many of the combatants are killed as possible, while securing a handsome monetary return for himself. He arranges for a battle in the main street, but it is interrupted before it can get started by the unexpected appearance of a government official who is making his rounds. In fear of outside government intervention the battle is called off, much to Sanjuro’s and the combatants’ disgust. In order to stir things up, Sanjuro captures two of Ushi-Tora’s assassins (they killed an official in another town) and delivers them to Seibei, who can then presumably expose Ushi-Tora to the government. At this point we are about halfway through the film, and we expect more of the same manipulation on the part of Sanjuro in his attempt to generate the mutual annihilation of the two gangs. But then something new shows up that changes everything. Unosuke, another younger brother of Ushi-Tora, shows up in town after a year’s absence, and it is his appearance that changes the narrative and makes things interesting. Unosuke (Tatsuya Nakadai) is an utterly satanic character with a chillingly duplicitous, angelic smile that makes your blood run cold. In fact this character, who resembles nothing so much as an Elvis impersonator, is so self-confident because he possesses a lethal capability that goes well beyond Sanjuro’s awesome samurai prowess – a pistol. With a perpetual smirk on his face, Unosuke demonstrates that he can kill any adversary at a distance, well removed from the threat of a sword or a knife. Prior to the appearance of Unosuke, one could dismiss Sanjuro as the bad guy, but now the tables are turned. Sanjuro in fact is shown to have a certain integrity to him, and he rescues the wife of a farmer who had been captured by Ushi-Tora’s men and forced into concubinage to serve the desires of their wealthy bankroller, Tokuemon. Sanjuro’s actions here are characteristically efficient: in the rescue operation he slays six of Ushi-Tora’s guards in about 15 seconds of screen time. The malicious power of Unosuke now takes over, however, and he invokes in my mind the disturbingly eviscerating power of evil that Jack Nicholson evoked as the Joker in Batman (1989). Soon Unoskue captures Sanjuro, and forthwith has his men beat Sanjuro to a pulp. In keeping with the film’s aesthetics of staccato-like violence that interrupts long periods of tension, the actual beating of Sanjuro is not shown onscreen. We just suddenly see a thrashed Sanjuro lying on the floor. Now for about the next twenty minutes of the film, Sanjuro is shown to be impotent and powerless in the face of Unosuke. During this period there is further destruction in the town. The sake brewery and silk factories are destroyed, and finally Ushi-Tora’s gang kills off all the members of Seibei’s gang. But even in his beaten state, Sanjuro manages to escape with the help of the café owner and recuperate in a temple outside of town. There is a final explosive “shootout” (lasting about 15 seconds) in the town’s main street between the lone Sanjuro with his sword on one side, and the ten men on the side – including the fire-armed Unosuke, Ushi-Tora, and eight other swordsmen. I will leave it to you to guess who wins this encounter. 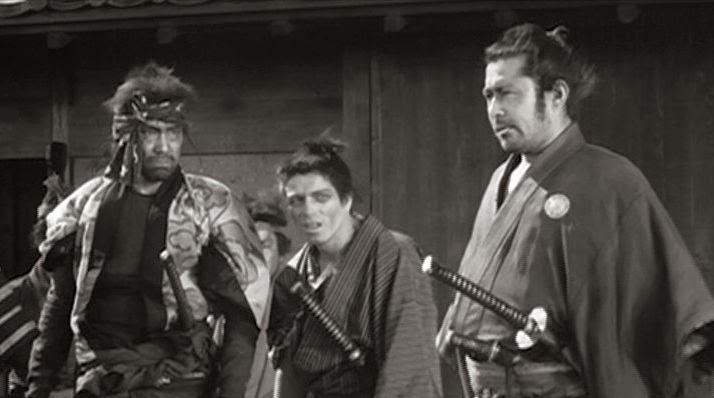 The ludicrous despicableness of most all the characters in the first half of the film (an aspect which may make some viewers sympathetic to Sanjuro’s opinion that they all deserve to be killed) is so ridiculous that I suppose one might view this part of the film to be a comedy. But it is the sinister appearance of Unosuke in the second half of the film that makes the story interesting – now it is a contest between implacable and highly contrasting foes. Sanjuro is shown to still have some degree of honor, while Unosuke is a remorseless murderer – the embodiment of the kind of soulless terrorist and democidal maniac that has inflicted our modern world. Kurosawa’s mise-en-scene is on full display in Yojimbo. The cinemascopic frame (2:35 to 1 aspect ratio) is fully exploited by cinematographer Kazuo Miyagawa to show a panoramic view of the action (do not see a frame-cropped version of this film). Kurosawa also employs, as he did in Rashomon (1950) and Seven Samurai (1954), the (studio-produced) “natural” effects of wind and rain to evoke human confinement and embedment in inextricable situations. With regard to the acting portrayals, the film acting features a number of characters who engage in exaggerated histrionics. This actually makes Mifune’s relatively low-key (for him) performance more effective. He still occupies a lot of screen space with his frequent ticks and body-scratching. 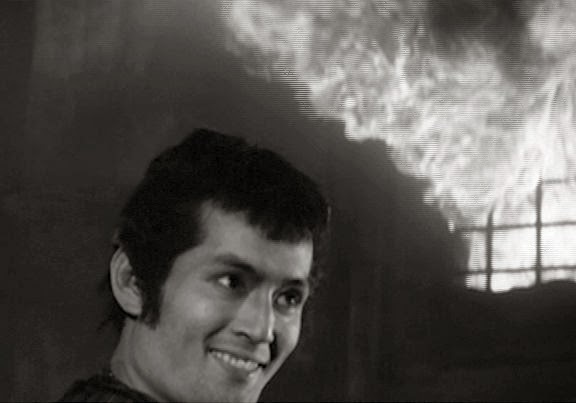 But he is rather more tame here than he was in Rashomon and Seven Samurai, and he comes across as a self-possessed and reflective personage, in good contrast to Tatsuya Nakadai’s demonic Unosuke. Unfortunately, Masaro Sato’s music doesn’t go well with the visuals at all. It is mostly modern (relatively speaking, that is – light jazz of that period) band music that is jarring and intrusive. You just have to put up with it as the musical cliche of films made during that period. So is Yojimbo an anti-war film, or an anti-gangster film? I would say no to both propositions, and I wouldn’t classify it as a black comedy, in the sense of Dr. Strangelove (1959), either. But Sanjuro is the modern anti-hero who goes his own way. In that sense the film is closer to the outlines of a film noir, only the setting is so far from the usual film noir circumstances that I would be reluctant to place the film squarely inside the strict sense of that category . Still, it really is all about the lone character trying to exist in a decadent and unprincipled world driven by unseen forces. The film has indeed been linked to Dashiell Hammett's novels, particularly Red Harvest (1929), see http://eddieonfilm.blogspot.com/2010/09/i-get-paid-for-killing-and-this-town-is.html.